There isn’t a season that’s harder on beekeepers, both hobbyists and professionals, than winter itself. Beekeeping in winter gets even more difficult if you’re just starting out. It doesn’t help that you become really anxious that your bees won’t survive the coldest season, either. Still, you do have power in your hands, not only to limit the damage, but more importantly to optimize the place you and your bees are at. This makes the winter season much easier to deal with and ultimately causes you less stress over the short term and long term so that you can work on your bees better. Best of all, following these tips increases the chances of your bees staying alive throughout the whole winter so they’ll be alive and booming next season. It is common knowledge that winter season is the time when the biggest losses occur to any beekeeper. But let us face it, this loss can be attributed to either bad management or ignorance on the part of the keeper. Most amateur beekeepers would have harvested most of the honey prior to the onset of winter and the hive may not be well protected from the elements. With these factors at play, a dead hive remains at the beginning of spring and you wonder why the beekeeper remains puzzled at the end of it all. We are to blame for this with no exceptions. Fortunately, you can prevent this from happening if you prepare well for winter. Some of the most common winter problems include: starvation, a wet hive, diseases, temperatures changes, predators, an under performing queen among others which will be explained below. This is a big problem in beekeeping and it is caused by poor honey harvesting methods. A beekeeper who takes away most of the honey stores in the hive will eventually end up starving the bees. The bees require at least 100 to 140 lbs of honey stores depending on the region. You can therefore estimate the amount of honey available at any given time. For example, if one frame can hold 10 lbs then that can be multiplied by the number of frames available to give a rough estimate of what is available in the hive. The outcome of a shortage in food over winter will begin to emerge at onset of spring. Bees are known for their exceptionally good hygiene. They usually engage in what is referred to as cleansing flights whereby they leave the hive in order to defecate or rid the hive of debris. 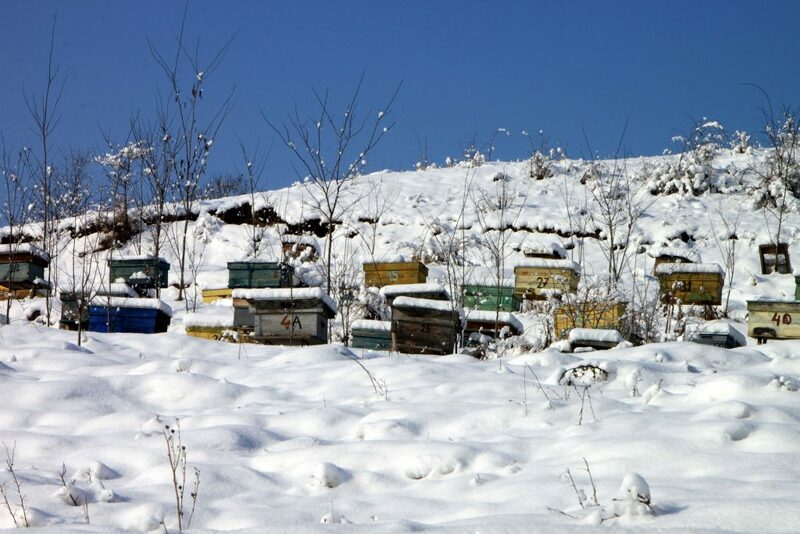 At winter it is almost impossible for the bees to leave the hive for this purpose due to the extreme cold. However, when they leave the hive, the bees may become trapped at the entrance when the entrance is blocked by snow. Others may be left outside and end up freezing since entries are blocked also. To curb this, clean off all exits and entrances after every snowfall. All types of predators from the small ones to bigger ones come brawling into the hive during the winter season in an effort to satisfy their appetite with stolen honey. These include wasps, badgers, woodpeckers, mice, bear, foxes, and many others. These predators not only consume honey but they also feast on the bees. Woodpeckers are a common sight during winter and foxes may come and go to be around throughout the year. They can even knock over unstable hives. A strap can keep the hive well secured in place. Wasps can be detrimental to a bee hive. They usually do not survive over winter since their queen hibernates. It is at this time that most of them engage in hive invasion. In fact, they are capable of destroying a hive within a few days. They consume everything including brood, honey, and the bees. A small hive entrance with wasp traps can help curb these notorious creatures. The bees also defend their colony from wasps and this can help. A failing or an old queen has the least chance of making it through winter for obvious reasons. Winter is not a season for the faint hearted. Therefore, it is not uncommon to experience a failing queen over winter. Queen bees that are on their second full season have a 50% chance of failing over winter. At fall it would be wise to re-queen just in case you might experience a queen failure at end of winter. Contrarily, a hive with a young and strong queen just before winter will most likely lead a strong hive at the onset of spring. Bees are rippled by pests and diseases not only during winter but also throughout other seasons. A keen eye should therefore be kept of them throughput the year. The tiny varroa mite for instance is a common problem during winter. It invades the hive and multiplies rapidly within no time. This pest lives on the throat of the bee and may eventually lead to a hive die out if not well managed. Some of the ways of controlling the mite include the use of mesh floors that act as traps through which they fall through into a tray beneath it. Chemical treatments help in the control of this mite. Finely grounded sugar as well helps dislodge the mite when applied. The Foulbrood, Chalkbrood and other diseases also pose a serious challenge if a proper fall examination was not conducted. Diseases should be eliminated before winter since it is more difficult to salvage a diseased hive when you have other serious problems during chilly winter. We can do all that is in our power to protect a bee colony over winter but at the end of it all lose a colony. This is part of the challenges based in beekeeping. Collapse of colonies can occur because of many reasons and some can be controlled. Disease control is particularly the best way to guarantee a colony survival by the time spring sets in. One of the things that make hive inspection difficult during winter is the fact that the hive is strapped up and sealed during this time so as to keep off predators. However, it is possible to monitor the colony during this time. A simple way is by pressing you ear against one side of the hive and feel the heat generated by the cluster. Tiny fragments of wax are also a common sight on the mesh floor during winter since bees uncap stored honey. There is ideally little you can do to protect the hive at peak of winter. Still, be sure to chase away woodpeckers, ensure the bees have enough food supply, and keep the hive dry. Sudden changes in temperature in the beehive can have a serious effect on bees. Bees usually respond instantly to these changes and this can favor or be to their disadvantage. For instance, extreme winter cold will force the bees to cluster so as to generate heat. Once the warmth generated is sufficient the individual bees leave the cluster and may take longer to return. As a result some of the bees freeze to death. The best way to ensure proper temperature control in the hive is to use a wind screen or foliage to block strong winds which can alter the hive temperature. Alternatively, the beekeeper can wrap the hive using recommended material. This will serve as insulator and also help provide a neutral temperature environment for your bees. It does not absorb heat and hence helps regulate temperature levels. Huge Bee Colonies – the larg colonies are usually the ones that are the first to disappear during winter. One of the reasons for this is the fact that the varroa mite thrives only in the presence of a large bee colony. Colonies that split before winter are less susceptible to the infestation by large numbers of varroa mites. Plenty of honey – a colony that dies out early will leave behind plenty of honey. An early winter death of a colony is sure to occur if the colony is attacked by mites early in the season. In most cases, a weak colony will abscond in fall or die before the onset of winter. Small cluster – a small bee cluster before and during winter will result in complete colony loss before end of winter. Varroa mites usually invade the cells and result in weakened bees. They also transmit deformed wing viruses (DWV) and other diseases that have serious effects on bees. The situation is further aggravated by the winter cluster which spreads the virus rapidly. Absence of bees on the bottom board – a pile of dead bees in the hive can occur whenever bees starve to death within the hive. However, sick bees cannot be easily detected since they naturally fly away from the hive when sick. This is an act of nature that allows the bees to prevent the pathogens from spreading. The sick bees that fly away or those that are too weak fail to return after the cleansing flights. White crystals on brood cells – the varroa mite leaves behind a patch of white crystals around the cells of the dead brood. Bees die after they emerge – developing bees suffer greatly in most of stages of their development due to viruses associated with varroa mites and many others. Parasitic Mite Syndrome (PMS) is easy to identify since bees die as they emerge. Colony Collapse Disorder (CCD) refers to situation where the worker bees disappear from the colony leaving behind the queen and plenty of honey reserves. CCD cases have dropped immensely over the last few years while winter loses still high. These two are distinct and differ in many ways. The sudden loss of the worker bee population and the absence of dead bees near the colony. The availability of abundant honey reserves and queen and brood bees left behind. The ultimate outcome of the loss of the workers is complete colony collapse since the hive cannot survive without the worker bee. Nonetheless, death in bees does not really mean CCD has occurred. The use of certain pesticides for instance can have a serious effect on bees. The beekeeper should thus be careful when it comes protecting bees from these harmful pesticides. Bee colony poisoning as a result of harmful pesticides should not be disguised as winter death or CCD. This is a bee kill incident that has resulted from pesticide poisoning. It is easy to distinguish acute poisoning of the bees from CDD with poisoning piles of bees die outside the hive. It is only in cases of heavily diseased colonies can one find a pile of dead bees outside the hive. Varroa mite infestation causing heavy losses in the hive. Emerging diseases such as gut parasite Nosema or Israeli Acute Paralysis. An exposure to harmful pesticides applied directly to the hive or those used on crops foraged by bees. Poor nutrition or lack of forage that result in malnourished brood and adult bees. Honey bee stress that can come as a result of beehive renting for pollination services. Environmental changes as a result of human activity. A hive with a strong queen and a healthy brood has a greater chance of making it through winter. It is therefore important that you inspect your hive before the onset of winter. If unable to sight the queen or have a brood pattern that does not look good, you should consider merging the hive with another or simply requeen. When requeening, keep the former queen in place until the new one has been accepted by the colony and has started laying eggs. If you choose to merge bee colonies then combine a weaker with a stronger colony. Weak hives should never be combined. Covering your bees in wrapping material is essential. This makes sure that the bees not only get all the warmth they need, but also have high quality access to air to breathe from. Tarpaper is what works best for bee hives, and you can wrap the hives by stapling the tarpaper on the outside. You should check that the entrances have large enough openings for the bees to breathe. There are specialized and commercially produced wrappings for bee hives, but we’re recommending tarpaper because of its accessibility. During the winter season, almost all of the time, it will simply be too cold to even think to risk exposing your bees to the chilling and freezing air. Checking the bees should be something you do as an extreme last resort. The best thing to do is to just let the bees be, and leave them to their own devices. You’ve done a great deal of work and expended a huge amount of effort to prepare the bees for the cold winter before this, and now the bees must do their part and keep themselves alive through the next few months. Trust and believe in your human preparation and the bees and nature to know and do what they do best. You should carry each bee hive to get a feel for its weight and how heavy you can expect them to be. Closely examine and inspect the bees often when winter comes, but at a distance outside the wrapping. You should have a good, general idea of how much each of your bee hives weigh. The minimum weight they should be at is more than 70 pounds (32 kilograms), since that number only considers the honey saved up. This weight and any above it is what will keep the bees kicking until the end of winter. If you know of any other steps to take beforehand as part of the preparations, do them now and don’t wait until the last minute. Any hives that are lighter than 70 pounds (32 kilograms) should be specially marked, so you can prioritize them and feed them first in the first week after winter’s end. Bring all your tools and equipment that are related to beekeeping for a good cleaning session, and make sure that each and every one is sparkling clean and more than ready for the coming winter season. Make sure that the tools made out of wood are completely clear of propolis and wax. A great way to do this is to mix water and washing soda together and to use your fresh cleansing “brew” to thoroughly purge the wax and other undesirable stuck material out. Sterilize the brood combs, especially the ones that have aged for a good long time. Bring out the frames and boxes and leave them in a safe spot for one week to air them out before you even use them, and long before the cold season comes. Taking these steps and precaution will eliminate any existing and potential bee pests. List all the tools and equipment you have for your beekeeping activities. Next up is to list the things you’ll need or feel will improve the quality of your venture and preparation, and then go on down to the brick-and-mortar supply stores dedicated to beekeeping. You can place an order for the ones you’re missing online. You can also just go online. Keep in mind though, beekeeping stores out there will have their hands full especially during the spring season, so factor in delayed shipping or delivery that’s slower than usual. If you want or need to get more hands-on and match parts and assemble the equipment yourself, this is the time that you must absolutely do it, well ahead of the next winter. The many months of the year minus those for winter is the most advantageous time to place an order for bees online and expect them to arrive on your doorstep shortly. You have to account for the bee shortages that will happen a lot during the first weeks of spring. You can reuse beeswax and honey not allotted for winter preparations, since there are people out there who’ll find them useful and would love to have them and will be willing to pay for them. Any time of the year is an excellent time to read, but more so before the winter season. Reading will definitely boost and increase the quality of your preparations. You can also peruse the information on BeeKeepClub.com, and join fellow beekeepers on forums on the Internet, and look for people who really know the in’s and out’s of the beekeeping business. In addition to perusing BeeKeepClub.com, keep in touch with beekeepers near where you live. This might even be the greatest thing you will ever do for your budding beekeeper activities. Join in on the learning and hands-on get-together events when they come up. Having people who love and practice the same thing you do, beekeeping, will keep you motivated to maintain your bees and inspire you to take your beekeeping to the next level. Remember that patience is a virtue. It’s something that will not only make your beekeeping hobby a much better experience, but it will also make your life more positive and enjoyable than before. That’s a wrap! Remember to apply each these steps thoroughly. It will be way better if you can follow them all, but putting as many as possible of these tips into your beekeeping practice will make your preparations, and even the winter season itself, a much more amazing journey and experience than you’d have ever expected at first! What other tips do you suggest for helping bees through the winter season? Leave a comment below and let us know.